These Roundback Cutters are designed for heavy-duty applications such as weeds, grass, and brush up to 2.5” or 3” diameter, depending on model. 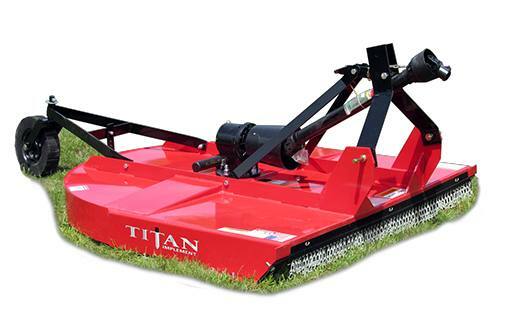 These cutters are designed to work with 35 to 95 hp tractors, and are available in 60”, 72”, and 84” widths. These cutters use a single spindle with two free-swinging blades, which reduce the shock of impact when a stationary object is contacted. A shear bolt through the input shaft or a slip clutch, if equipped, protects the gearbox and driveline from damage. Standard equipment includes driveline shields and clutch shields. Front and rear chain discharge shields are optional.